Art Specifications: Art must be usable digital files and should conform to the art specs found on our Art Check List. Changes made after production begins will incur additional charges. E-Mail & FTP: Submit files smaller than 3MB via email to your Sales Counselor. Send us files up to 80MB with our upload utility. Remember to also send a printed sample of what you expect the art to look like. Refer to our Art Check List for details on art submission. Copyrights: Customers warrant that all images supplied for reproduction, whether digital, conventional or otherwise, are unencumbered by copyright and other usage rights connected to the image(s) and agree to hold harmless and indemnify DIGISPEC® for all claims and expenses for any actions in law that may result from the use of these images. Color Conversion: Colors should be defined as CMYK (4-Color Process). All spot colors will be converted to CMYK. Converting spot or RGB colors to CMYK will change the appearance of the color, sometimes dramatically. Special Inks – Offset Lithography: 4-Color Process conversions for spot colors are used. Ink is matched to COATED Pantone® colors but ink color is not guaranteed to be an exact match. When color matching is critical, always order a production proof. Special Inks – Sublimation: All sublimation is printed using 4-Color Process inks. Pantone® (PMS) colors are matched where possible using 4-Color Process inks. Within the limits of sublimation, precise matching of PMS colors is not always possible. Metallic and fluorescent colors are not available for sublimation pads. When color matching is critical, always order a production proof. InDesign: InDesign is our graphics department’s preferred layout software. All placed images should be sized at 100%, not enlarged or reduced in the layout, and original image files must be provided with the layout document. PDF layout templates can be downloaded from our Stock Shapes page. Photoshop: We use Photoshop to edit and correct all photographic images and complex illustrations. As with all submitted work, images should be sized and cropped to final size. When a clipping path is needed, create it by using pen tools and establish the fewest number of control points possible. When saving a file with a clipping path, please set flatness to at least 3 pixels. Changing the resolution of an image from, for example, 72ppi to 300ppi will not improve the appearance of the file — it will actually be the correct resolution, but still appear "low res". Illustrator: Make sure colors are defined as either spot or CMYK depending on the intended final print. Convert all text to curves/outlines to avoid font problems. As with a layout program, placed images must be sent along with the Illustrator file and should be properly sized and cropped in the originating program prior to placement. Offset Lithography: All images submitted for hard surface mouse pads are printed as submitted. Image resolution should be set at 300ppi – remember that effective image resolution is decreased when an image is enlarged in a layout program; so, images should be 300ppi at 100% size in the final document. While standard offset reproduces color and detail very well, the product surface can sometimes alter the color and appearance of the printed image. When color is critical, we always recommend a surface proof or a production proof. Dye Sublimation: Sublimation is a specialized process that prints special heat activated inks on an advanced "transfer" paper. Heat and pressure are applied to the transfer, causing the ink to turn into a gas dye, which then sublimates into the fabric. Once the image is transferred, it is permanent and washable. This heat activated ink transfer process produces a 100% to 400% dot gain, which impacts all reversed or "knocked out" art. When reversed elements are too small, the dot gain may fill in the reversed area or eliminate it completely. For this reason, we recommend all reversed type be set to bold. Serif fonts such as Times should be set at 18 point or greater and sans serif fonts like Helvetica should be set at 12 point or greater. All reversed lines should be 1.5 points or greater. Image resolution should be 300ppi. During the sublimation printing process, a color target is used as a reference only. The sublimation process is designed to produce a "pleasing" representation – not an exact match – of the original. Some color variation from a color target is normal and expected. Any time color is critical, we recommend a production proof. Registration: The nature of our manufacturing processes limit registration of the print to the product's edges to ±1/16". Borders: When art includes a border or other art element that runs parallel to the mouse pad's edges, the naked eye can distinguish slight variations in print positioning. For this reason, we do not recommend the use of a border. See an example. Separations, Files, Plates, & Dies: All separations, digital files, plates, and dies created by DIGISPEC® remain factory property. Our storage policy is to keep these materials on file for 24 months. After 24 months, reorders are treated as new jobs and require new art and set-ups. Original art is returned on request. Original Size: All mouse pads are initially cut to ordered size. 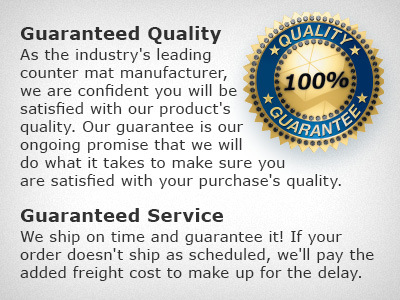 However, since the mouse pads have a natural rubber base and the sublimation process uses high heat and pressure, the dimensions of the final product may vary from ordered size. This shrinkage and/or growth is a normal and expected effect of the sublimation process.